Look for the SUP flags and banners. 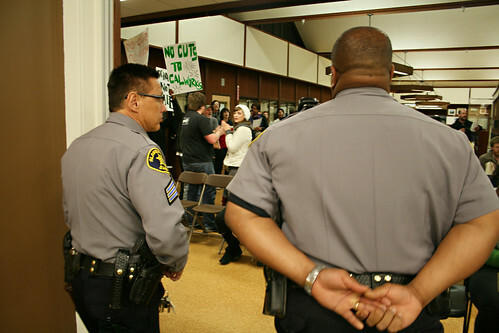 The students of Laney College stand at an important moment in time. The cuts from the Peralta administration are an attack on us. Every budget cut takes control over our education and our future out of our hands. The cuts take different shapes and hurt us in different ways. Not only as students, but as people of color, as queer people, as mothers, as working class peoples, as disabled people – all of us have been shown nothing but neglect and contempt by the administration. 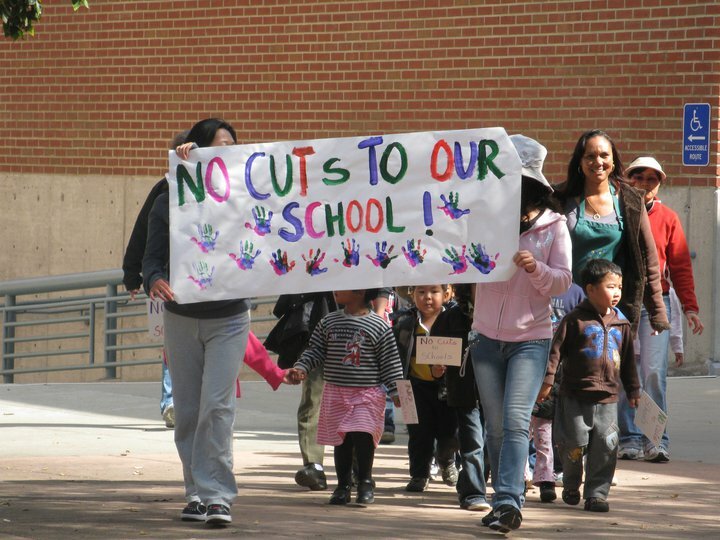 As the most precarious populations at our school, we are always the most affected by the cuts. One of these populations is transgendered people. There are no safe spaces for transgendered people to use the bathroom on campus, and often trans people face harassment and confusion when dealing with students and faculty. As of last year, all students have also been forced to pay a fee for non-existant health services such as counseling – so for trans people there is often nobody to turn to on campus, even though such a service is promised to us. If admin has their way, our situation will only get worse. If we want this to stop, we will all need to stand up for one another and fight back. After years of mismanagement and blatantly illegal and wasteful spending, the District and the Board of Trustees want to solve their budget crisis on the backs of students and the workers who advise us, teach us, take care of us and clean up after us. Last week, word spread that the Board planned to eliminate the positions at Laney of 1.5 Disabled Student Programs and Services (DSPS) workers and cut 21 other positions at Laney from 12 to 11 or 10 months per year. Management approached individual classified workers to tell them about the cuts, in violation of SEIU 1021’s contract. We hear that the reason only Laney workers are being targeted is because Laney’s President volunteered to begin cuts at our school, even though Laney is structurally underfunded by the District to begin with. On Monday morning, the Chancellor’s office announced that the Chancellor planned to remove the cuts from the following night’s Board agenda, the result of a deal struck with the leadership of SEIU 1021. All three unions (PFT, SEIU, IUOE) recently started negotiations with the District on their contracts that expire on June 30. Historically, the District has “negotiated” with SEIU and IUOE by laying off their members. The unions’ staff and leadership then try to stop the layoffs by filing charges as they explain to members the need for concessions, that they are doing everything they can behind closed doors and in court, there’s only so much money to go around, how we need to take the fight to Sacramento, etc. etc. As there is “little resistance” to Gov. Jerry Brown’s proposal to raise community college fees from $26 to $36, it’s worth remembering how the District has wasted funds and broken the law, all while blaming “Sacramento” for its problems. In 2009, the administration illegally gave itself a pay raise. The Board refused to act, and later made the pay raise official. District mismanagement and lack of Board oversight led to Peralta being placed on probation by the State Accreditation Commission. In 2010 the Board hired an audit team to put together its first budget in about 1 ½ years. The audit team has cost at least $750,000 so far, probably much more. In July 2010 the Alameda County Grand Jury wrote that “The board as a whole has failed to provide the leadership for the district to which they were elected.” They also cited Board members’ repeated violation of District policies, like Trustee Marcie Hodge’s shopping sprees with a District credit card. Cuts are redefining the purpose of community college after previous waves of struggle by independent, militant social movements led by disabled people, single moms and Black working-class youth opened access to community colleges. They also used political demands to decide for themselves what they learn in class and how the school relates to their community. No otherwise qualified handicapped individual in the United States…shall, solely by reason of her or his handicap, be excluded from the participation in, be denied the benefits of, or be subjected to discrimination under any program or activity receiving Federal financial assistance. 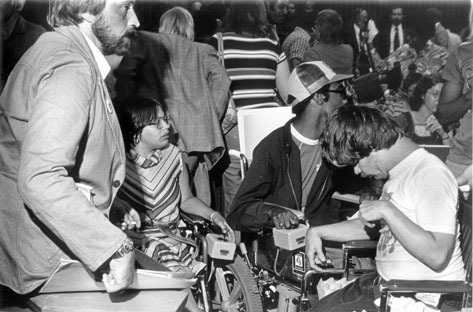 In 1977, coordinated sit-ins across the U.S. took place to demand that the federal government create regulations to enforce the Rehabilitation Act passed in 1973. The San Francisco sit-in of as many as 200 people with disabilities lasted over a month, making it the longest sit-in at a federal building in U.S. history. Without caregivers or equipment, some risked death, but they were supported and cared for by broader circles of movements; Panthers served them meals. During the 1977 San Francisco sit-in for Section 504. We need to be equally brave in our defense of movement victories, especially in a time of austerity. It’s expensive for the state to continue to expropriate surplus value as the rate of capital accumulation declines. We refuse debt, we refuse schools that exist solely to make us good workers and governable subjects, and we refuse to allow capital to “cut” the lives of single moms, disabled folks and poor people when it runs out of ways for us to produce value for our masters. And to do all this we need to recompose ourselves to defend each other, take control of our schools, win the social wage we need to take care of ourselves and ultimately to destroy the state: Laney cuts back. Students and cops have nothing in common. We mourn the life of Guy Jarreau, Jr., a member of the Napa Valley College Black Student Union and childcare worker who was recently murdered by a cop while shooting a music video. Later in the agenda on Tuesday, the Board approved a new contract with the Alameda County Sheriff’s Department to patrol our campuses. This is the same agency that arrested and beat us during the Oscar Grant protests, that surrounded Wheeler Hall in riot gear during our friends’ occupation, that patrols our neighborhoods and runs immigration status checks as part of the “Secure Communities” program. We want these armed men to stay away from us and stay off of our campus. Instead, the cops are a typically wasteful arm of the District. The Sheriffs are one of the few areas of the budget that come from the discretionary unrestricted general fund, meaning that the Board has the freedom to replace the pigs or remove them altogether. Instead, the Sheriffs went $1 million over-budget in 2008, a fact that was only discovered when outside auditors dug through the District’s records over a year later. One man, this Lieutenant, makes more than any worker at Peralta, including faculty, classified staff and custodians. And while the Sheriffs’ secretary may need therapy to cope with taking orders from uniformed men with clubs, over $150,000 in benefits for a single person seems excessive as the District demands health care givebacks from classified workers at the bargaining table. Kids from the Laney Child Care Center walk out on Oct. 7, 2010. District-wide, there were 1,992 fewer students on January 23, 2011 than there were on January 20, 2010. Every semester, we watch Laney deteriorate: fewer class sections, fewer students, overworked custodians struggle to pick up all the discarded plates, papers, cigarette butts. And it’s sad to watch the organizations that are supposed to represent our interests manage their own decline. But we fight for ourselves, our friends who have already been pushed out, and the single moms, disabled students and custodians in struggle. We, as members of activist and community organizations in the Bay Area of California, send our support for your strike against the terrible conditions you face in Georgia’s prisons. We salute you for making history as your strike has become the largest prison strike in the history of this nation. As steadfast defenders of human and civil rights, we recognize the potential that your action has to improve the lives of millions subject to inhumane treatment in correctional facilities across this country. Every single day, prisoners face the same deplorable and unnecessarily punitive conditions that you have courageously decided to stand up against. For too long, this nation has chosen silence in the face of the gross injustices that our brothers and sisters in prison are subjected to. Your fight against these injustices is a necessary and righteous struggle that must be carried out to victory. We have heard about the brutal acts that Georgia Department of Corrections officers have been resorting to as a means of breaking your protest and we denounce them. In order to put a stop to the violence to which you have been subjected, we are in the process of contacting personnel at the different prison facilities and circulating petitions addressed to the governor and the Georgia DOC. We will continue to expose the DOC’s shameless physical attacks on you and use our influence to call for an immediate end to the violence. Here, in the Bay Area, we are all too familiar with the violence that this system is known to unleash upon our people. Recently, our community erupted in protest over the killing of an unarmed innocent black man named Oscar Grant by transit police in Oakland. We forced the authorities to arrest and convict the police officer responsible for Grant’s murder by building up a mass movement. We intend to win justice with you and stop the violent repression of your peaceful protest in the same way—by appealing to the power and influence of the masses. You have inspired us. News of your strike, from day one, has served to inspire and invigorate hundreds of students and community organizers here in Berkeley and Oakland alone. We are especially inspired by your ability to organize across color lines and are interested in hearing an account from the inside of how this process developed and was accomplished. You have also encouraged us to take more direct actions toward radical prison reform in our own communities, namely Santa Rita County Jail and San Quentin Prison. 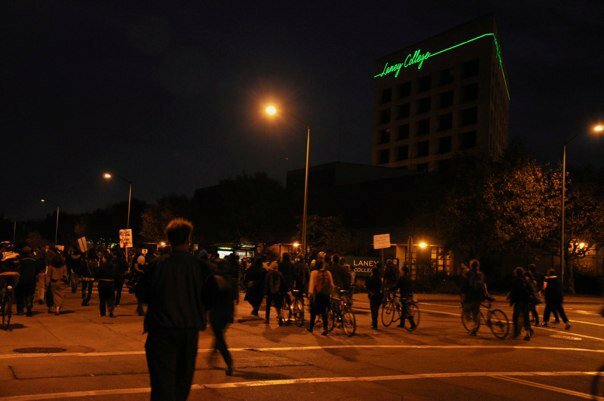 We are now beginning the process of developing a similar set of demands regarding expediting processing (can take 20-30 hours to get a bed, they call it “bullpen therapy”), nutrition, visiting and phone calls, educational services, legal support, compensation for labor and humane treatment in general. We will also seek to unify the education and prison justice movements by collaborating with existing organizations that have been engaging in this work. We echo your call: No more Slavery! Injustice to one is injustice to all! In us, students, activists, the community members and people of the Bay Area, you have an ally. We will continue to spread the news about your cause all over the Bay Area and California, the country and world. We pledge to do everything in our power to make sure your demands are met.